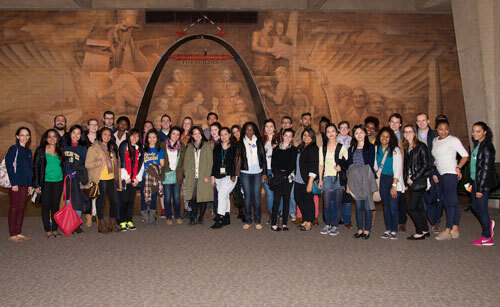 The inaugural summit included 29 students from eight campuses. Vienna has been selected as the host for the Webster University 2017 Global Student Leadership Summit (GSLS) to be held June 3-10, 2017, President Elizabeth (Beth) J. Stroble and Provost Julian Schuster announced this week. Strong interest following the inaugural summit, held in 2015 at the St. Louis campus as part of the Centennial celebration, resulted in plans to repeat the program every two years and rotate its location around Webster’s international campuses, with respective campuses supporting the students they send to the summit. Vienna was selected as host for the 2017 summit after the coordinating committee reviewed several proposals. GSLS provides a mechanism for student leaders to learn and share insights and ideas that enhance academic and student life experiences for all students at all campuses. The inaugural summit in 2015 brought 29 students representing 20 nationalities from eight campuses together producing several student-centered initiatives. “The original Global Student Leadership Summit helped develop and encourage a global citizenship mindset among the diverse, worldwide student community that makes Webster so unique,” said Julian Schuster, Webster’s provost, senior vice president and chief operating officer. recruited for the 2017 summit in Vienna. For GSLS 2017, a cohort group of 26 student leaders will be recruited from the St. Louis, Geneva, Vienna, Leiden, Thailand, and Ghana campuses within the University’s international network, and will be selected through an application process that includes a review of leadership involvement and work experience. The program goal is that student participants return to their home campus and implement the skills and knowledge acquired to improve student life throughout the Webster University network. The GSLS Coordinating Committee consists of Ted Hoef, John Buck, Jennifer Stewart and Katie Knetzer. The planning group will be expanded soon to include faculty, students, and staff from the international campuses. Look for more information about applying for the 2017 cohort soon.